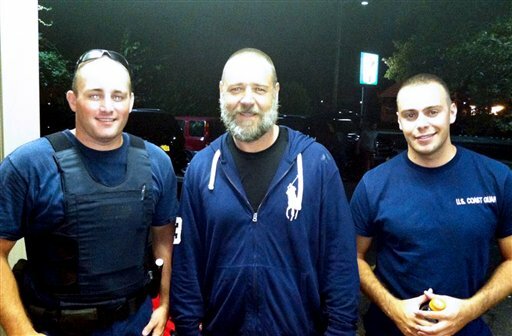 Russell Crowe, center, with Coast Guard petty officers Robert Swieciki, left, and Thomas Watson. AP/Coast Guard photo. Despite the Coast Guard’s warnings to stay safe on the water this holiday weekend,one Hollywood star got stranded in Long Island Sound. 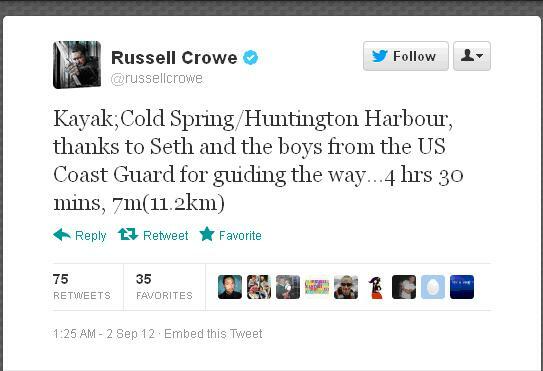 Russell Crowe was kayaking with his friend in Cold Spring Harbor off Long Island Sound on Sept. 1, according to US Magazine. The pair lost track of time and headed in to shore at dusk. They landed at Huntington Beach, N.Y., 10 miles from where they began their journey. Coast Guardsmen from Coast Guard Station Eatons Neck were patrolling the area when they heard Crowe yell from shore around 10pm, the magazine reported. The actor and his friend paddled over to the 25-foot rescue boat and were taken aboard for a lift back home. Crowe even thanked the service via Twitter later that night. Crowe is filming for his newest film, “Noah,” on Long Island, according to US Magazine. It is set to be released in March 2014.